I've been reading the book "Intuitive Eating" (HIGHLY recommend this book if you've had problems dieting/yoyoing/want to learn more about listening to your body's biological hunger cues etc) and felt like sharing my favorite tips from the book AND my personal experience on how to control your eating, whether you overeat or BINGE, try out some of these tips to control your eating. Lose the "diet" mentality.... or stop dieting IN GENERAL! Sometimes hunger can be mistaken for THIRST! Drink up! Fill that belly with hydrating H2O! Also, don't be afraid to drink water with your meals!I know I used to be a stickler for "don't drink water or liquids while you're eating because you'll mess up your digestion and blah blah etc etc" so I never used to drink any liquids while I ate. NOW, I shut that rule out of my brain and drink water, because it helps fill me up during my meals! This way I get more full, which helps me not over eat! Take your TIME. Chew as slowly as possible. Savor each bite. Fill all your senses. Smell the aroma, feel the textures in your mouth, taste the flavors across your taste buds. This will also help you decide if you're actually enjoying your food or not. Does it even taste good? If not, don't feel obliged to finish it! Put it away, save it for later, give it to someone else, anything! Don't feel like you HAVE to shove it in! Take your time and enjoy your food. Also, when you're out with friends in a social gathering, don't feel like you have to match their pace at eating! Put the utensils down more, be more social, talk more instead of stuffing in food as fast as possible! It's no race, it's social friend time! Craving a cookie? But you're afraid of eating it, so you go for rice cakes or plain yogurt instead, only to find yourself not satisfied? So you go looking for more "substitution foods" to eat instead of that one cookie? Well now look what's happened: you've eaten a bunch of rice cakes and a tub of yogurt trying to fill yourself with those instead of eating that cookie, when you could have just had that ONE cookie instead! You've filled yourself up with probably more calories and macros with those substitution foods than you would have if you had honored your craving and eaten that one cookie. Honor your craving, have that ONE thing, savor it (remember rule 2. Eat slowly and SAVOR), enjoy it, really let all your senses enjoy it, and move on. During your meal, take a slight break. Put your fork or spoon down more often. Think to yourself, am I still hungry? How do I feel? Is my stomach filled? Am I uncomfortably full? Am I still a little hungry? Take a break or a few during the meal to evaluate your fullness factor! If you're full, then you've had enough! If not, keep eating slowly! Again, same deal with the Eat Slowly rule. You want to be able to enjoy your food COMPLETELY. So that you can enjoy it, you can tell when you get full, you can fully appreciate what you're eating. Don't eat in front of the TV, or while standing next to the fridge. Set yourself a nice place to eat, sit down, and enjoy. Again, following the other tips here while you're eating. Remember when we were kids and our parents would always say, "Clean your plate!" Well now's time to be a Bada** and say NO! Hahaha not in a mean way or anything, but don't feel like you HAVE to finish your entire plate! Don't feel bad about leftovers! When people say "Oh you know people in ______ would be so happy to have that plate!" and make you feel bad about it, don't feel guilted into eating more if you're already full! Do you think eating that all will help the starving people in ______? Not really. But it might make YOU feel uncomfortable, bloated, and overstuffed. Just do what's right by you and don't feel guilted into eating more than you think you should. When you're hungry as a wolf, of course you're going to overeat! Try and battle this by having little snacks throughout the day or try to eat before you get overly hungry. When you feel that nudge of emptiness in your belly, maybe it's time to grab some grub! 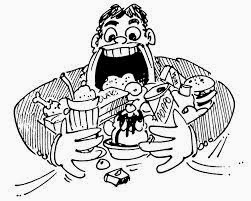 But when you have that empty bottomless pit feeling in your stomach, that's when it might be danger zone for an overeating feast! This is CRUCIAL. You can't keep the idea of "diets" on the mind, because that means RESTRICTION. 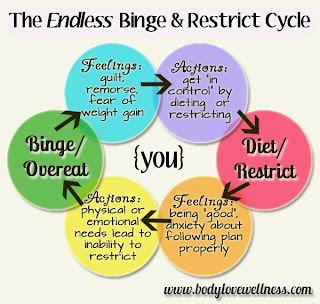 With restriction comes the all too familiar cycle of: restrict foods --> water weight loss --> temporary happiness --> restriction overload leads to overeating --> binging episodes --> need to "diet" again --> REPEAT. "Ok. Starting my diet tomorrow. SOOOO... Let me finish off all these ____(insert delicious foods you'll be restricting yourself of in the future here aka cookies brownies cupcakes etc)____ "
Uhm.. NO. 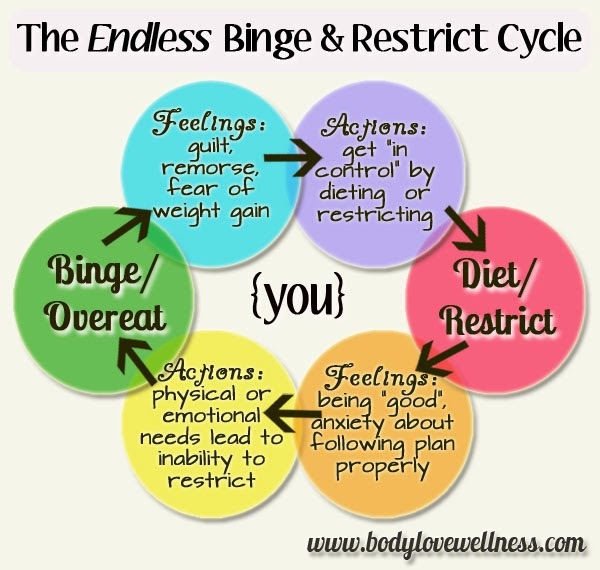 The cycle of diet -- binge -- diet will keep happening if you keep on having that mindset! INSTEAD, aim for life changes. Don't restrict things completely. Let yourself have that one treat, KNOW that it will still be there. If you think it'll be gone forever or if you put it off limits, of COURSE your body is going to crave them! So eliminate that from your head! Make it lifestyle small changes! No need for crazy restriction. Everything in moderation, not deprivation!